It does not matter how far you are moving, The Mover’s Choice has eco-friendly plastic moving bins for rent that simplify the moving process. And our plastic bins, which come in an array of colors and stackable, are durable and make for a smart move. The Mover’s Choice is the original plastic moving bin company and since 1988 we have been working with many commercial, corporate and industrial clients in Toronto, Mississauga and across the GTA. 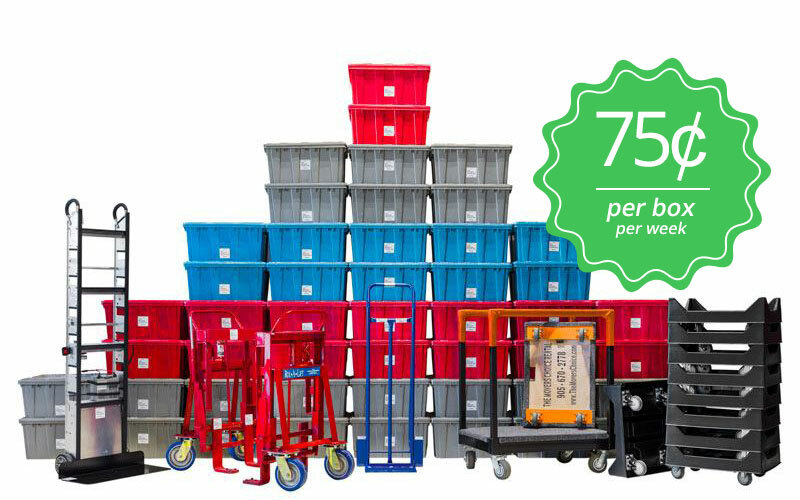 Utilize our plastic moving bin rentals that are reusable. We offer competitive pricing that beats out the competition and we also have a large selection of moving equipment to meet your needs. ✔ design firms ✔ facility managers ✔ office managers etc. Rent plastic moving bins & equipment with a quick phone call, it’s that simple. You can pick them up when you are ready for your move. Delivery or pick up is also available in the GTA, please call for pricing information. There are many benefits when using our plastic bins for moving. They are superbly durable, eco- friendly, and you won’t be out spending your time collecting cardboard boxes and tape. The Mover’s Choice simplifies the moving process – that’s what we are great at! Our plastic moving bins are amazing for sensitive equipment including computers, printers and other sensitive office equipment. Since 1988 all our clients have raved about our plastic bins for moving. We work with everyone: retailers, notable moving companies and van lines, and droves of companies in Toronto and across the GTA. Save time, save money, and get moving today!